There are few theatrical experiences where you get to enjoy (or “tuck in”, as the Kiwi’s would say) the food you watched being cooked during the performance. In Mrs. Krishnan’s Party, that is exactly what audiences guests are invited to do. It is a fitting end to what is a delightfully immersive experience from New Zealand’s Indian Ink Theatre Company, currently taking up residence at The Cultch. The set-up is relatively simple. In a meta nod, we are all paid guests in a surprise Onam party in the back of Mrs. Krishnan’s dairy (a convenience store for us North Americans), organized by her young boarder James. While a reluctant host at first, Mrs. Krishnan soon embraces the spirit of this Hindu harvest festival honouring King Mahabali. The guest experience starts long before you arrive at The Cultch though, with four ticket options for the 75-minute intermission-less show. While none of them are particularly bad choices within the intimate Culture Lab (unless you have issues with standing for an extended period), one can’t help but think those choosing to sit at the central dining table would be more fully immersed in the party. Of course, being so close to the action isn’t everyone’s cup-o-teachai, so any of the other options will likely appeal to those who are more comfortable watching a show in the dark. But don’t be fooled into thinking you can become entirely invisible if you decide on the cheap seats, as one of the great pleasures in attending this party comes from being an active participant. Whether it is assisting in the preparation of the food, handing out scarves and garlands, or helping to reinforce some little white lies to spare the feelings of the show’s two characters, participation is encouraged. Don’t worry though, none of the show’s audience participation is designed to make you uncomfortable. In fact, you may even find yourself slightly disappointed as others around you are pulled in to help. 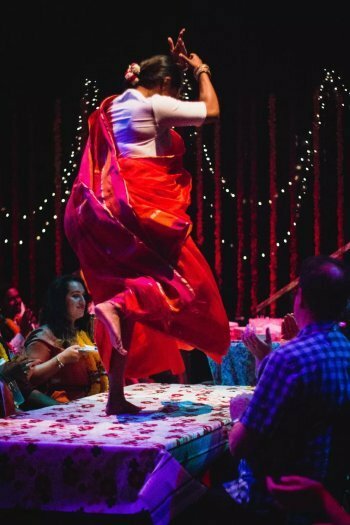 Mrs. Krishnan (Kalyani Nagarajan) lets loose on the dining room table in this immersive theatrical experience from New Zealand’s Indian Ink Theatre Company. It isn’t all about a simple Oman celebration though, as both Mrs. Krishnan and James are wrestling with some personal problems, and potentially life-changing decisions. And while the issues they face are intended to provide some of the dramatic tension, they do feel forced at times inside a show that is also big on improvisation. Knowing that they must hit specific scripted moments, the transitions can be a little stark. 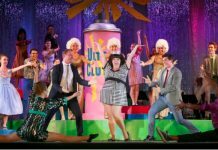 This is a small price to pay though for a show that so lovingly embraces its ever-changing audience, and one which also relies on a good dose of improvisation. The ultimate success of Mrs Krishnan’s Party comes via the skills of its two actors, Kalyani Nagarajan (Mrs. Krishnan) and Justin Rogers (James). Both open-hearted, their sincerity is as generously overflowing as the pot of dahl cooking on the stove. Rogers, who sets the festive tone as he seats each guest, is so likeable it is hard not to feel sorry for his revealed plight. Nagarajan thaws nicely as Mrs Krishnan, and the lady sure can bust-a-move. On opening night, the heavens opened as the audience guests began arriving at The Cultch. Cold and a little wet, there was something particularly satisfying in being welcomed into the warmth of the room behind Mrs. Krishnan’s dairy, and the lives of its two inhabitants. The dahl served up at the end of the night was just what we needed to send us back out. Mrs. Krishnan’s Party by Justin Lewis & Jacob Rajan. Directed by Justin Lewis. An Indian Ink Theatre Company production, presented by The Cultch. On stage at The Cultch’s Culture Lab (1895 Venables St, Vancouver) until February 3. Visit thecultch.com for tickets and information. Editor’s Note (18 January): this review was edited as it originally identified Justin Rogers as co-writer & director.